【FIRE PROOF & WATER RESISTANT】:Made of newest high quality Liquid Silicone Coated Retardant-fiberglass exterior,which can withstand temperatures as high as 1200°C/2192°F ， liquid silicone also has the very high resistance to water, so we fire the envelope will ensure that all valuables are 100% safe. 【Easy To Carry】Envelope shape, lightweight design, can be classified to manage your cash, photos, passports and other items, travel carrying is very convenient and does not take up space. this item will make sure nothing can go wrong with your valuables.Fireproof envelope also can used for Wedding, Birthday, Baby Shower, FundraisersParty invites, Scrapbooking, Card-making , Gift Card, Gift Wrapping & Decoration or anything you want etc. 【Casual Design, More Suitable For Life】A stylish handbag design，suitable for both men and women. It is also the best choice for gifts. 【After Sales Service】: RUBUN promise to give you best friendly customer service and 1 year warranty service.Any further problems with your items, please feel free to contact us. 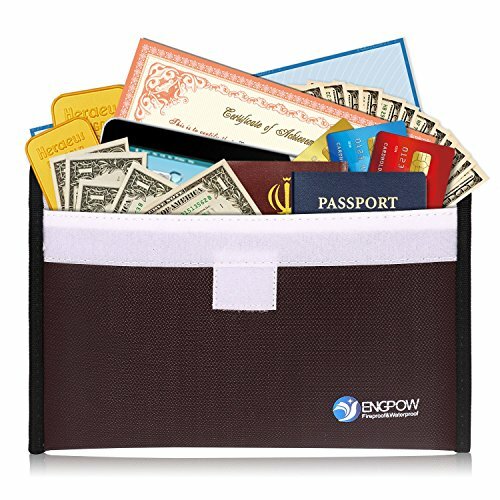 【Security Steward】This fireproof bag safe envelope protects valuable items, such as your documents & files including legal contracts, passports, licenses, USBs disks and CDs deeds, certificates, coins, cash, autographs, letters, heirlooms, precious photos,marriage certificate, money and more. nothing is more important than safety, especially in the case of transport. That is why we have created the fireproof envelope safe bag: fire resistant,water resistant, explosion and smoke proof. Perfect for car titles, birth certificates, etc.